Nutritional Brands is one of the world’s leading global nutritional companies. Aerobic Life is its largest and best-selling brand. 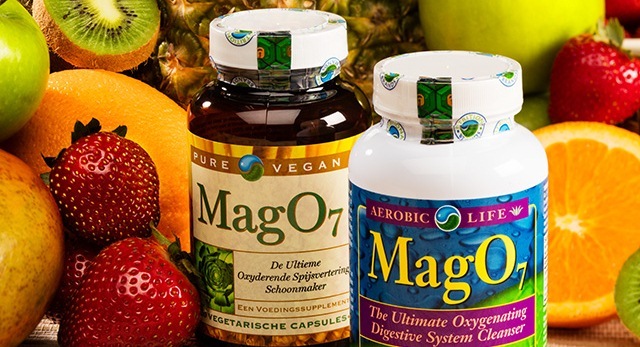 The Aerobic Life line is in the digestive health and immunity category, where its MagO7 product is the most widely known and used digestive health and immunity supplement worldwide. MagO7 is a proprietary product and literally a brand in and of itself under the Aerobic Life brand umbrella. Nutritional Brands became concerned when a long-time customer said her latest purchase of MagO7 from an online retailer didn’t look right. The bottle was different and so were the capsules. The company immediately realized this was not its product and contacted the online retailer. Unfortunately, the online retailer was reluctant to remove the storefront. It took several weeks and the prospect of legal action, but finally the site was removed. To protect its trademark and brand name, as well as the quality and integrity of its product/ingredients, Nutritional Brands needed a solution that would make it difficult for imitation products to be easily put into the marketplace. It was also important to give customers the confidence in knowing the products they purchase are authentic. The eventual solution was a safety seal shrink sleeve combined with a special holographic feature. The new construction replaced a clear shrink film sleeve that covered the cap and neck of the bottles. The solution accomplishes several things. The construction incorporates a shrink sleeve that functions as a tough safety seal. But integrated into the inside of the shrink sleeve is a 3D holographic strip called Izon® that was developed by DuPont™. By bringing these visual and material elements together WS Packaging created a very powerful level of authentication. According to DuPont, the full 3D security images engineered into Izon® offer simple and intuitive recognition for Nutritional Brands’ customers. The security technology confounds attempts to duplicate, which validates product authenticity and enhances the overall brand image. The clear shrink film is printed with a two-color repeat pattern of the Nutritional Brands logos. The Izon® holographic strip is literally bonded to the inside of the film to create a highly overt security feature. The shrink sleeve is seamed and covers the top edge of the cap and the contour of the full neck of the bottle. The new label creates another layer of consumer confidence and value in knowing Nutritional Brands has done everything it can to protect its customers and provide them with the best product available. For a closer look at the brand protection solution Nutritional Brands undertook, read this profile in Packaging Digest magazine.